For Abel release their debut album, ‘Greater Inventions’, on 16th May. We’re not going to be shy. The album is magnificent. Vic Galloway was right! But rather than bore you with superlatives, we’ll stick to the facts. Sky Sports are currently featuring the track ‘On TV’ on Champions League trailers. The album follows 2 singles released on Art Goes Pop which gained radio play from BBC Radio 1 & 6 Music’s Steve Lamacq, Vic Galloway, Huw Stephens, Colin Murray, Tom Robinson and Jim Gellatly as well as NME radio’s Chris Martin and XFM. Press has included Artrocker, The Skinny and Rolling Stone Italy. Video plays include Channel M, MTV2 and Popmorphic. Highlights include playing Glastonbury, Rockness, SxSW Texas, GoNorth, In The City Manchester and 2 successful U.K tours with Select Booking Agency. For Abel also won the Magnus Magnusson award and recording of the album attracted funding from Creative Scotland. For Abel feature on the current Strummerville compilation and appeared on Artrocker’s ‘Jail Guitar Doors’ compilation. To support the album release the band are heading out on a UK tour where people will have the exclusive opportunity to buy the album ahead of it’s official release date. Venues include King Tuts (Glasgow), Voodoo Rooms (Edinburgh), O2 (Birmingham), The Well (Leeds), Troff (Manchester) and Buffalo Bar (London). Guitarist Colin Healy will be defying medical advice to play the tour with a broken leg. But just how did Colin break his leg? Full info coming very soon! A single, ‘Yorkshire’, will be released summer 2011 on Flowers In The Dustbin. The band have signed a production deal with Universal Publishing Productions through Lo Recordings which has already seen ‘On T.V’ featured in Channel 4’s ‘Fifa Road To The World Cup’ documentary and album opener ‘Telephone’ feature on the next Lo Editions Indie Circuit mail out. ‘Greater Inventions’ was produced by Green Door’s Sam Smith. Flowers In The Dustbin first stumbled across For Abel in their original incarnation as Nacional. We have been fans since the band formed. Flowers in the Dustbin is a multi media collective. To date we have released 8 singles/eps and 1 novel, including in 2011 the debut singles from Nevada Base and Mummy Short Arms. 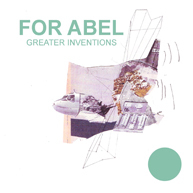 For Abel – Greater Inventions is Flowers 10.